Thanks for your time. 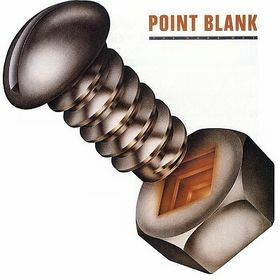 I would like to talk about history of Point Blank. Lets start at the beginning. Before Point Blank were you or others in any bands? Any releases with that? John O’Daniel: I have played in bands since I was 12 yrs. old, none of which released any music. I did record 1 song in1963 with my good friend Mark Garth, but it was a single. I think we sold almost 15 copies.haha. Rusty Burns: Starting at the young age of 8 yrs old, I played at many events, including most of the local talent shows in Texas, with the help of my father, Bob Burns, who handled every part of my young musical career. In 1968, when I was only 16 years old, we released my first record. Later, I made sure the copies of that record were destroyed, as I realized how I needed to improve my recording! 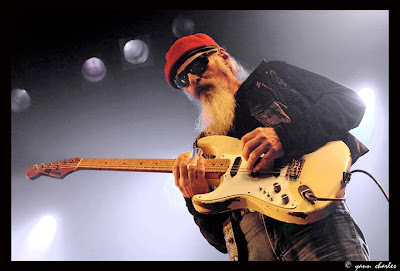 In 1972, I signed a contract with the manager of ZZ TOP, Bill Ham. 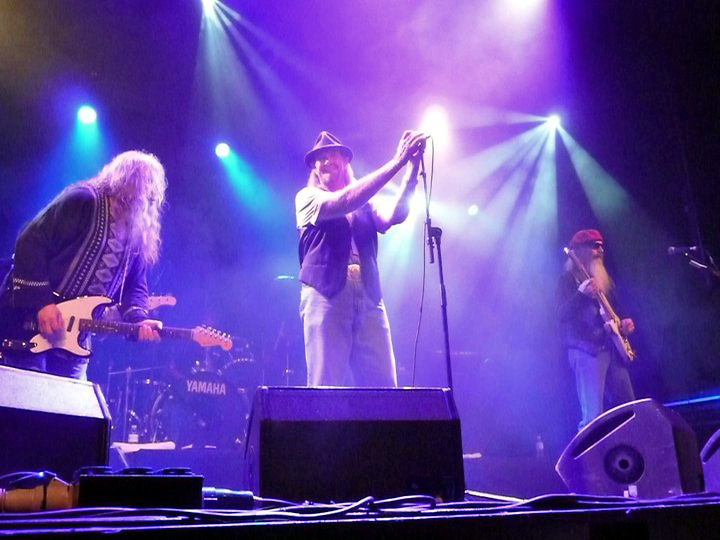 I spent the next two years searching for players to create what I envisioned – a rocking blues band! 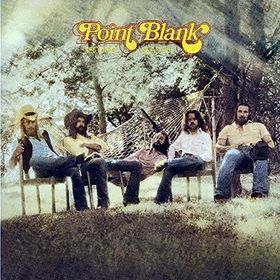 The band formed was the earliest beginnings of POINT BLANK. How did you guys come together to form Point Blank? Why the name Point Blank? John O’Daniel: I went from Tulsa OK. to Houston to meet Rusty on advise from Buzzy Gruen. We met, jammed and talked, and fell in love with each other’s style and attitude. We’ve been partners ever since. The name seemed to fit our “in your face” kind of style of music, and we felt very marketable. Rusty Burns: In 1973,John O’Daniel, Buzzy Gruen, and I were playing in a band together at a chain of clubs named THE CELLAR. From the first time we played together, we realized that we had a very powerful chemistry and were surely destined to play a lot of good music as a band. 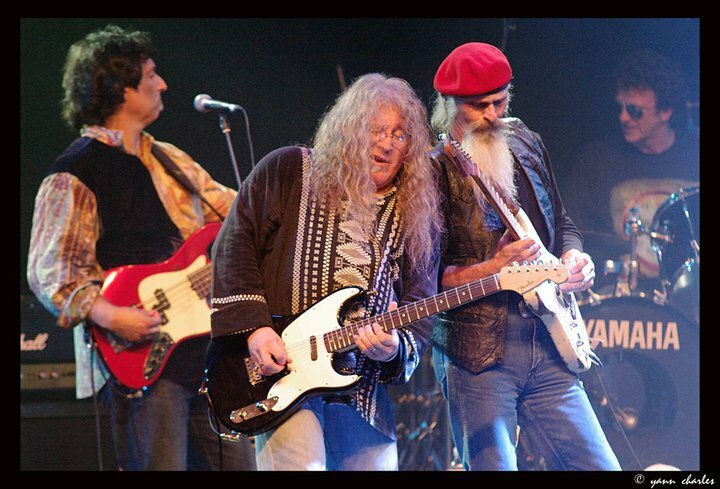 Fortunately, we assembled this band with like-minded players who shared the same vision and desire to create, write, and perform our favorite TEXAS BLUES ROCK style of music. We named the band ODESSA. Later, in September of 1974, we changed our name to POINT BLANK, after together making a list of names that promoted our style and intensity. I still have the piece of paper somewhere with all of the names we considered! 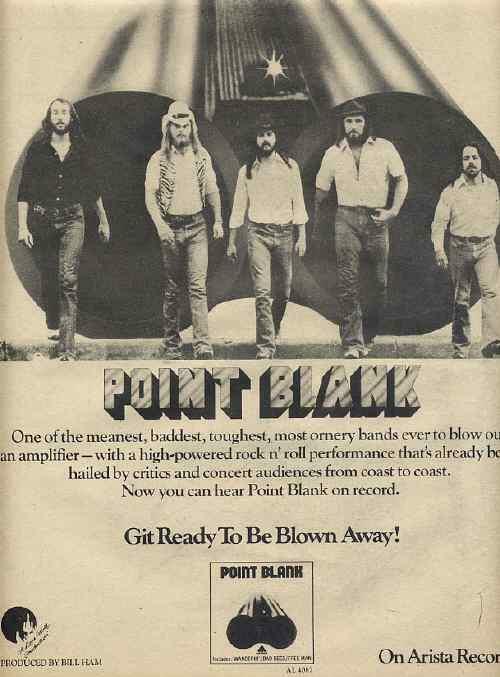 I came up with POINT BLANK as the name for our band while on a tour from New Orleans, Louisiana to Houston, Texas. 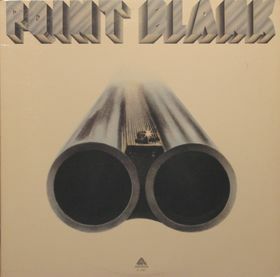 The name POINT BLANK seemed to convey our TEXAS BLUES ROCK musical attitude, as well as giving one a good visual image through the double barrelled shotgun concept, which appeared on our very first album. What can you tell me about some of the earliest session you had as a band together? John O’Daniel: Like most new bands we practiced a LOT! !.and played any and everywhere we could. We had so much fun, the money was’nt our top priority. We played in West Texas on Rusty’s b-day, and when we got payed we owed the club money because of our bar tab. 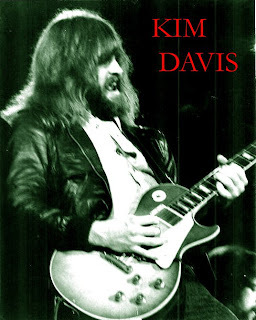 Rusty Burns: Our first recording sessions as POINT BLANK, in 1975, took place in Memphis,Tennessee. We walked in to the studio equipped with nothing more than about 14 songs and a minimal amount of recording studio prowess. 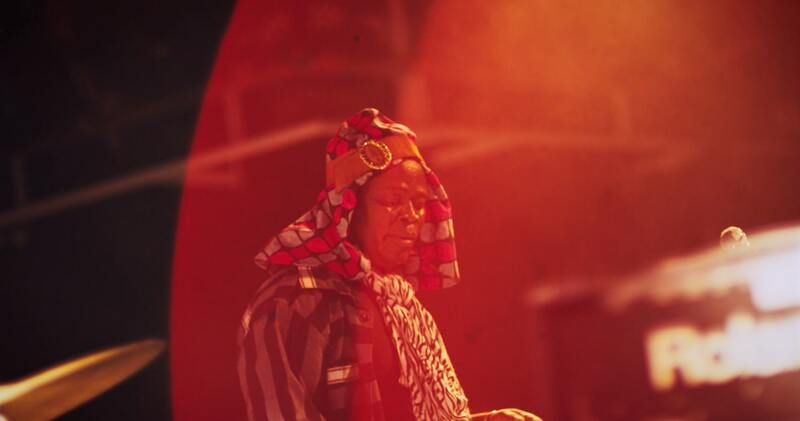 We had to rely on our ‘on stage performance’ raw power and high energy to make up for not having much experience in the studio and we quickly found that our high energy was the mechanism that triggered the acceptance from our most loyal fans in the earliest days. In 1976 you released debut album on Arista Records, which is in my opinion one of the best electric blues & southern rock studio album. Really killer stuff. I would like if you can tell us what do you remember from recording and producing your first LP? Who did the cover artwork? John O’Daniel: The main thing I remember of that first studio session is how much we DIDN’T know about big time recording. It was a whole new world for me. I have no idea who did the art work. Rusty may know, but I don’t. 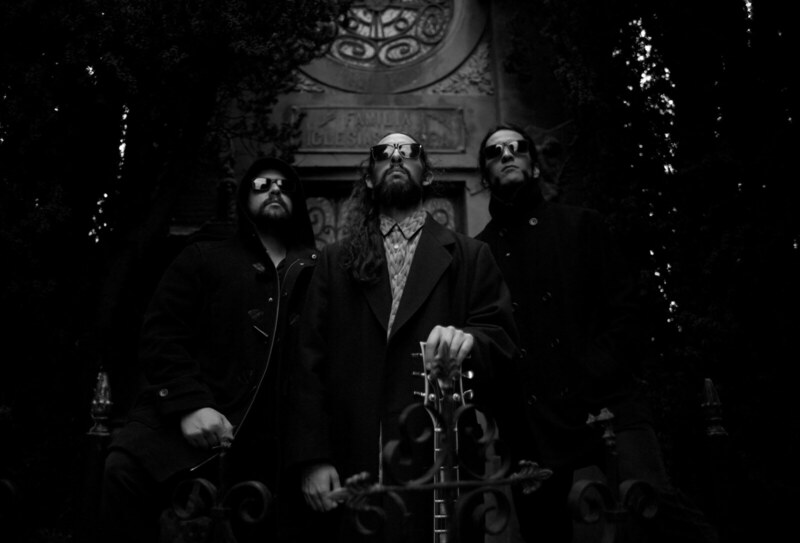 Rusty Burns: We recorded all of the songs we had written up to that point, during those original sessions. After songs were chosen for the first album, we realized we still had almost another album’s worth of songs on tape. These same sessions yielded the vast majority of the songs that would be released the next year on our second album for ARISTA RECORDS, entitled SECOND SEASON. 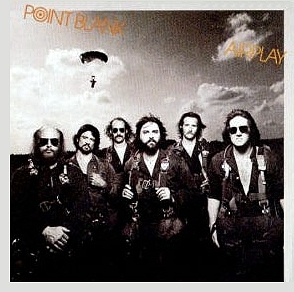 The cover photos for POINT BLANK’s first two albums were both Bill Ham’s concept, shot by Mark Lee and Linda Lesser. Second Season was your next album from 1977. Another great raw album. Would you like to tell us a bit more about it? John O’Daniel: That was the first time we concentrated on lyrics as much as the music track. We were growing as a band. 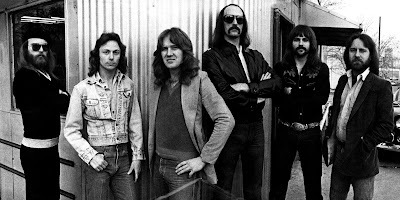 Rusty Burns: The SECOND SEASON sessions saw POINT BLANK walk into the studio exhausted and delirious from having played over 300 performances during 1976, while we were promoting our first album. We needed more quality time to write and rehearse new material, and as I said earlier, many of the songs on our second album were already recorded during the first album sessions. This proved to be quite helpful by having a large portion of the album ready to rock! 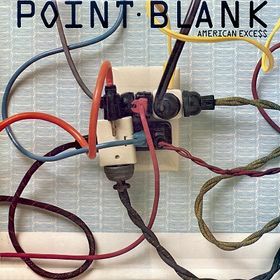 SECOND SEASON would be the last recording for ARISTA RECORDS by POINT BLANK. Well your third album Airplay from 1979 is a bit different. You added a keyboard player and the sound changed a bit. Why did you decide this way? John O’Daniel: It, to us, wasjust a natural progression. We merely went with what felt good to us. Rusty Burns: By the time we recorded the AIRPLAY album, we were beginning to mature as a band. I en-liken a band’s albums to a photograph, as simply a snap shot of a particular time of that child or in this case, band’s life. 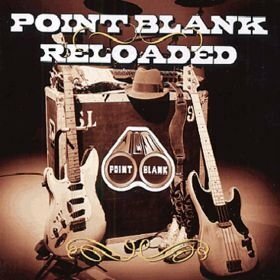 Music with POINT BLANK was an ever constantly changing event, even to this day. Many people really connect to a specific record as they would a specific photograph, but the subject of the photo is constantly changing and maturing. POINT BLANK’s records will all show that we were envisioning to lay out a body of musical works with change being an integral part for us as musicians and artists. We were always searching to start a new musical fire and after we had burned a musical landscape, we were compelled to move forward. Adding keyboards, we greatly expanded our musical boundaries! Further in the 80’s you released thre more albums The Hard Way, American Exce$$ and On a Roll. What happened next? John O’Daniel: I left the band after THE HARD WAY, so you’ll have ask Rusty about that. Rusty Burns: After recording four records for MCA RECORDS, with a TOP 40 HIT and a relentless touring schedule, POINT BLANK disbanded in 1984. You are known for playing a lot of shows. I would like if you can share some interesting stories that happened on the road, while touring in the 70’s. John O’Daniel: It would take too much time and ink to tell specific stories. Let’s just say we saw and tried it all in those days, and only regret a few things we did or said. Rusty Burns: We toured an average of more than 250 shows a year throughout our years on the road and there are so many memories, many of them foggy, that it becomes a blur. We are currently trying to put together ‘the best and worst of times’ in a book. I’ll refrain from sharing the stories right now and let the book shine a light on the insanity, struggles, and excitement of those days gone by. In 2007 you came back with new album called Reloaded, which is a live album recorded in 2005 and in 2009 you released new studio album called Fight On! It’s a first one in 27 years. How do you like it? John O’Daniel: I like it a lot. In part I think because I got to wrie and work with Rusty again This time without the pressure of label or mgt. desperate need of a liver transplant. I felt we should record the show to document the music and spirit of the event. When we listened to the recording afterward, we were all shocked that we had a memorable performance after 25 years of not playing together! When our loyal fans in France heard we had recorded the show, the wild fire began! Suddenly, we had new fans, a big record deal, and a European tour, including a Sweden rock festival in 2007. Since then, we have been blessed by being invited to return to Europe each year and share with our wonderful rocking fans some smoking music! Now you are touring again and recording a new album. Would you like to tell us more about it? John O’Daniel: It is as much or more fun now as it was then. We are a little smarter now and able to dodge or evade the snags of the road that caused us grief in the past. I love this biz so!!! Rusty Burns: At this time we are writing some powerful new songs and recording them as we create them. 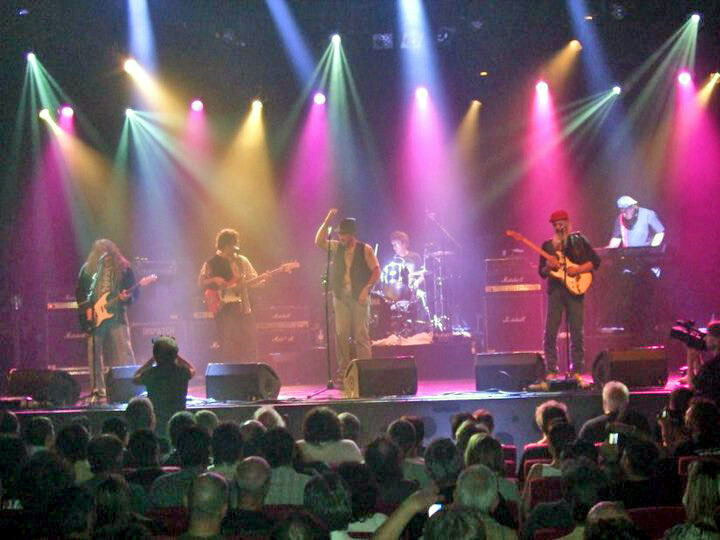 We will also soon be releasing a DVD recorded at our Paris, France performance at THE BOBINO THEATER. What are some future plans besides album? John O’Daniel: Right now my thoughts are on this tour and the new recording. I’ll make more plans when we have completed that. 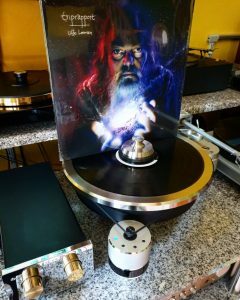 Rusty Burns: It feels so great to be recording records and touring again! This is what we enjoyed for so long and I am very happy to be doing what I love to do the most! Thanks a lot for your time. Would you like to add something, perhaps? John O’Daniel: I will only add, we are looking forward to our trip to Europe to play for what I feel is the warmest crowds on the planet. God bless and be well. 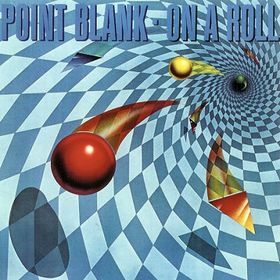 your friend Johnny O.
Rusty Burns: Thank you so much for your personal interest in POINT BLANK and for sharing our story and music with those who already are and others I hope will become POINT BLANK fans! We are extremely excited to be returning to Europe in July 2011! Rock On!